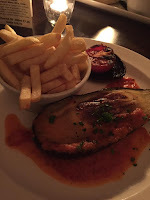 Listings of vegan food choices when out and about in and around Colchester, Essex. As we sit down at Colchester’s new Wagamama restaurant, situated on the flourishing Colchester High Street, ready to taste some of the updated vegan menu (including the flagship recent addition of ‘vegatsu’) my stomach is crying out for some flavoursome, Japanese grub. If you haven’t been to Wagamama yet – what are you waiting for? The restaurant chain’s vegan offering is impressive, even by the standard set by many food outlets in 2018. The thing that seems so ground-breaking about eating at Wagamama is that every time we’ve been of late, there has been no assumption about what we might want to eat. “Does anybody in the group want to look at the vegetarian/vegan menu?” the staff usually ask. A small thing to get excited over, but a hint at a future where eating meat needn’t be seen as the norm. Suddenly, we’re equals with our omnivorous dining buddies. At Colchester Wagamama the staff can’t do enough to help. I’d be tempted to assume that this may be due to the lure of positive comments, when they are aware of the looming write-up that was due after our attendance. But, we've been yet to have a bad experience at the restaurant – no matter how busy it has been, the staff have always gone above and beyond to give us a good experience. As for the food? It’s creative, tastes amazing, and isn’t lacking in size. Between the four of us, we got to try a variety of menu options. Naturally, the vegatsu stands out for its similarity to its meat counterpart. The inclusion of breaded seitan on a mainstream restaurant’s menu has rightly caused a ripple of excitement throughout the vegan community, and if you used to eat Wagamama’s meat-based Katsu curry, you won’t be disappointed by this one. It will have any meat eater questioning their need to ever eat chicken again. If you’re not a fan of meat-alternatives, or prefer your meals to be a little more complex, then you may want to avoid it, however. The large dish composed of strips of seitan, white rice and lots of katsu sauce, whilst delicious, might leave you craving something less simplistic. Luckily, the rest of the menu more than makes up for that. We tried the Yasai Samla Curry, the Kare Burosu and the Yasai Pad Thai and left incredibly impressed by all of these dishes for their generous portion sizes and fresh, crunchy ingredients that came packed with flavour. If you’re wondering which side to get, we adored the Mixed Mushrooms & Panko Aubergine Hirata Steamed Buns, so they come highly recommended. 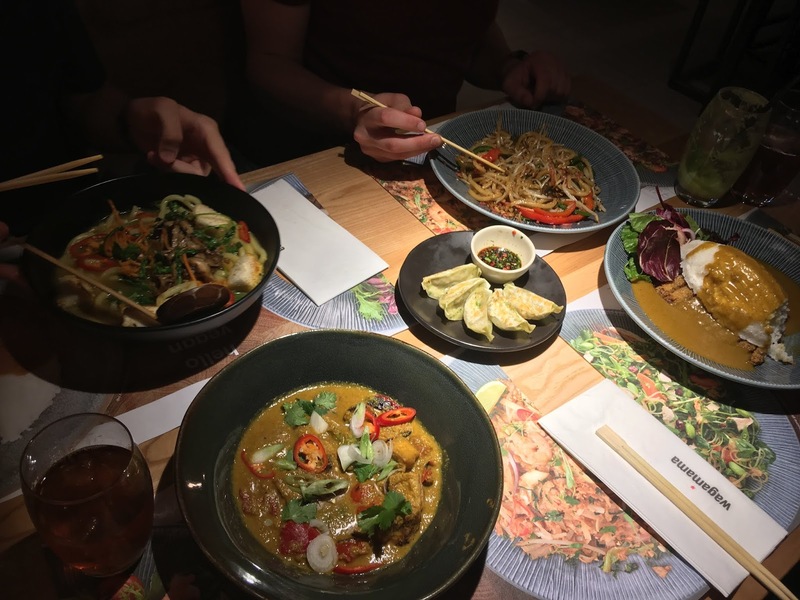 It is becoming easier every day to eat vegan when out and about in Colchester, and chains like Wagamama are contributing in huge amounts to our thriving vegan scene. The fact that the vegan menu is so diverse and dynamic means that you can keep coming back again and again – we certainly will be. TFI Vegan food trailer launching! Just over two years ago, in the spring of 2015, Jennifer and Robert Dunn opened Colchester’s first vegan café — The Den at Twenty Three. The response was huge. They managed to show that a fully vegan café could not only survive but thrive. The bar had been set, and since their opening, veganism in Colchester has gone boom, with more plant-based cafes and businesses starting up all around the area. 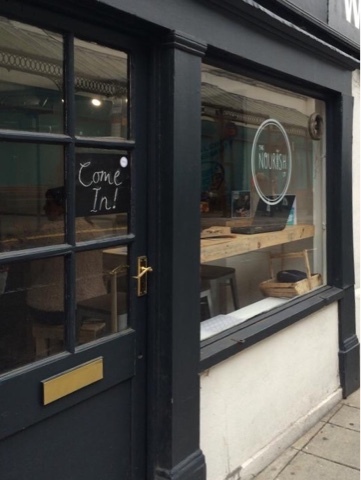 After two successful years of establishing The Den as a must-stop spot on the Colchester foodie scene, the couple are venturing out with their brand new sister company TFI Vegan. The food trailer will be launching at the Big Sunday event at Firstsite this weekend. 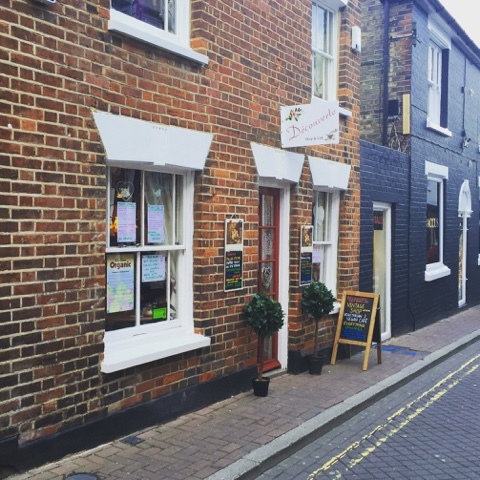 Vegan Colchester caught up with Jen to find out all about the new venture. Hi Jen, congratulations on the amazing success you’ve had with The Den and on the launch of your new business. Why are you launching TFI Vegan? When we first started The Den, our mission was to not only provide the vegans of Colchester with somewhere to eat, but also show non-vegans that not all vegan food had to be the same, hopefully getting rid of some of the negative stereotypes along the way. We now get people coming in and telling us that they went vegan because of us, which is so flattering to hear! Because of this, we feel like we achieved one of the major things we set out to achieve and it’s now time to branch out and continue with that mission in other places too. Especially places where there isn’t much around for vegans. What does this mean for the future of The Den? We hope you’re not shutting up shop! Absolutely not! The Den is here to stay. We’ve built up an amazing customer base and have so many lovely regulars that we will be keeping The Den around to continue serving the burgers, paninis and cakes that people know us for. Because Colchester has such a large vegan community, I think that it’s important to have somewhere for those people to sit down and have a chat, coffee and cake with vegan friends. We wouldn’t want that to be gone. So your plan is to take vegan food to the masses, what made you decide to launch in Colchester? Colchester has always treated us really well and we felt like it was only right to let them see our new venture first! Will the food on the trailer be similar to The Den? We’re going to keep some of our Den classics and bestsellers which people love as we want to stick with our trademark comfort foods which are so popular, but are adding a few new twists to the menu! Can you give us any examples of these twists? One of the ones we’re most looking forward to showcasing is our new BBQ pulled ‘pork’ burger, which comes with a tasty apple slaw. It’s our new favourite burger and we think our customers will love it! Thanks Jen and best of luck with the new business! · Check out their Facebook to keep up to date with where they are and what they’re up to! 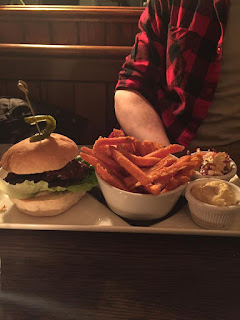 Whilst the Colchester vegan scene has gone from strength to strength over the past couple of years, one area that remains distinctly lacking is places to eat out in the evenings. But as veganism continues to grow, restaurants are starting to take notice. The re-opening of The Warehouse on Chapel St. North is one such example. A steakhouse they may be, but their animal-friendly options aren’t to be sniffed at. Of course, eating in a restaurant that also serves slabs of meat is (understandably) not going to suit every vegan, but for those whom have non-vegan family and friends, it provides a great balance for those difficult family meals out. And we’re not just talking about the regular falafel burger which often frequents the vegan section of any menu. 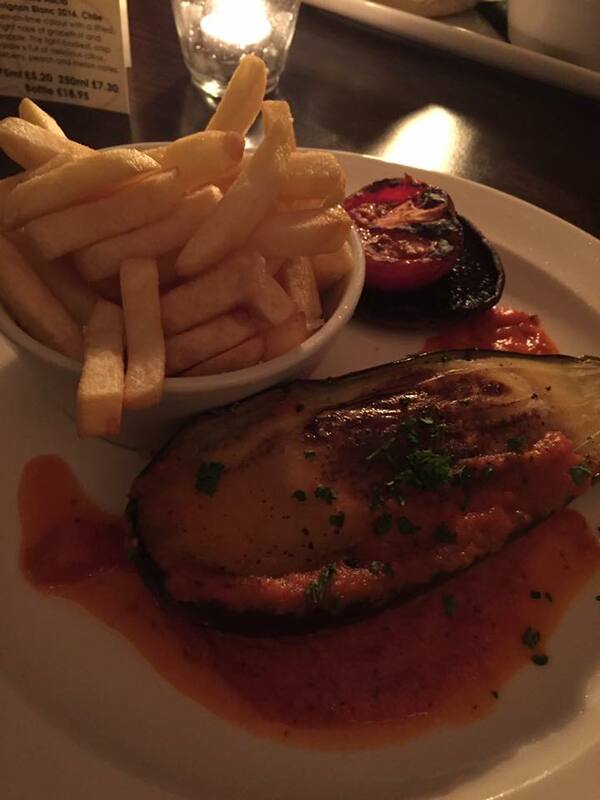 The owners of The Warehouse have clearly put in some effort to come up with an exciting offering for vegans, with options on the starters, mains and desserts; you don’t have to miss out on a three course meal. From curry, to spaghetti, roasted peppers, a stuffed ‘eggplant steak’ and the ever-popular BBQ pulled jackfruit, there is something for everyone here. I’ve eaten a lot of jackfruit over the past year, and I must say that their mushroom and jackfruit burger is probably the best I’ve had; I highly recommend it. But it was the attention to detail with little things that impressed the most. 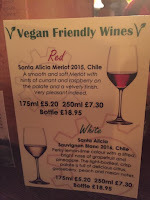 Having vegan mayo and other sauces available, as well as the sign on the table to indicate which of the bottles of wine were vegan-friendly. It’s always a relief to know that a restaurant is taking veganism so seriously. So next time you want somewhere new to try, then pop along to The Warehouse, and show that there is a big demand for vegan food in Colchester. 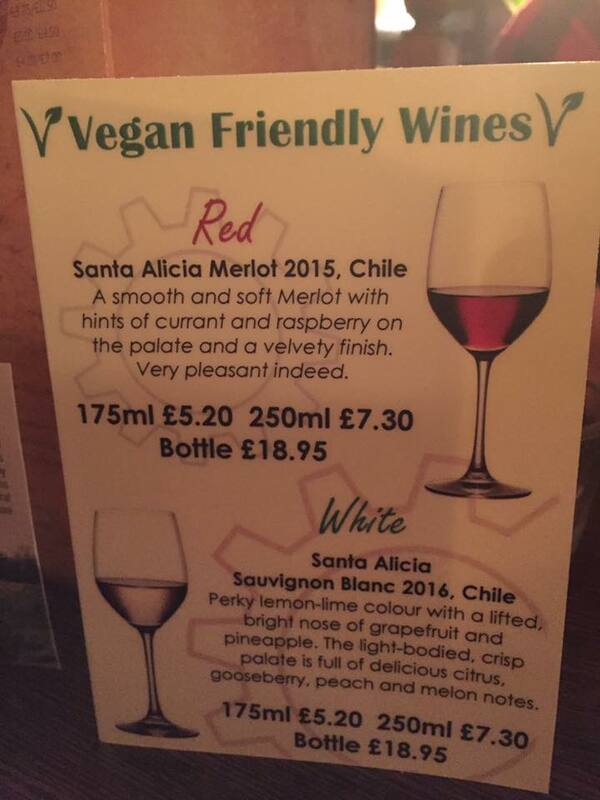 That vegan menu is surely only going to keep growing. Flashback two years, and veganism was just beginning to make ripples in Colchester. The summer of 2014 saw the very first Colchester Vegan Fair take place at Colchester Arts Centre, and exceeded all expectations with most stall holders selling out before the day was over. Fast forward to summer 2016, with Colchester’s 3rd Vegan Fair about to take place and it is clear that the times are changing. We’re suddenly living in a very different vegan landscape to that of 2 years ago. Credit for the rise of the vegan movement in Colchester must, in part, go to the opening of The Den at Twenty Three in March 2015. The Den has managed to seamlessly cross over into the mainstream whilst serving a wealth of hungry customers, from vegans, vegetarians, the v-curious, meat reducing, and omnivores alike; everyone is welcome. All the time using their brand of tasty, regular food (think burgers, paninis, cupcakes, hot chocolates, ice cream, etc.) to show just how indulgent eating vegan can be. Bland rabbit food this most certainly is not. 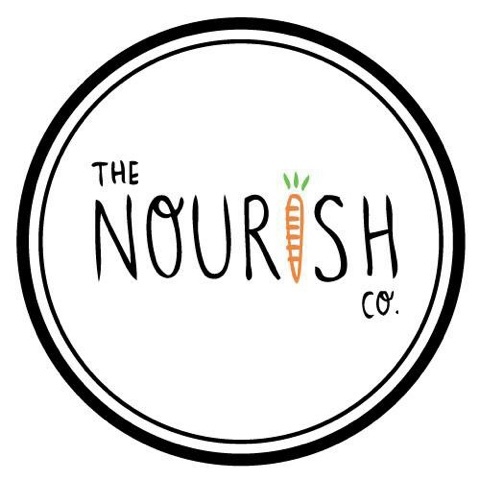 Whilst The Den shows that veganism doesn’t have to equal healthy; vegan eco-takeaway The Nourish Co. prove that if it’s quick and healthy you’re after, then you’re catered for too. Stop off on your lunch break to pick up their hearty hot dish of the day, trademark mushroom and lentil ‘sausage’ rolls, ‘smoked aubergine’ BLT, or a plethora of raw, nourishing sweet treats courtesy of local business The Moral Munch. As if two vegan cafés wasn’t enough, brand new for 2016 is café number three: Découverte. This vintage, tearoom-style eatery serving organic, home-made meals in quaint surroundings has given the vegan community of Colchester another option for when eating out, and shown the growing demand there is for plant-based food. If you’re only in Colchester for the day, visiting one of the town’s many events throughout the year, whether that be Christmas markets, food fairs or the Colchester Free Festival, then you’ll be likely to see one of Colchester’s vegan catering companies #V Catering Co. or Organic Alex armed with a stall full of vegan treats to fill up on. Each of these local businesses hold a monthly event at The Waiting Room on one Friday of the month, so be sure to head along to support them. Veganism in Colchester doesn’t stop at food either. The Garden of Eden Beauty parlour at Lucky Rose Tattoo Clinic on Eld Lane has a fully vegan range of beauty products. So if it is cruelty-free manicures, facials or other treatments you are looking for, then Colchester has you covered. The award-winning lifestyle magazine Vegan Life is also based and run in Colchester by local vegans, becoming so successful nationwide, that it’s now being shipped to the US too! Plus the creators have now started up the brand new Cook Vegan magazine. Colchester’s speedy rise to ‘vegan force-to-be-reckoned-with’ shows no sign of stopping, Battered is a new vegan ‘fish’ and chips business, further showing that eating vegan doesn’t have to mean missing out. Look out for their trailer serving vegan lard in Colchester and surrounding towns. There seems to be something about being vegan that brings out the inner entrepreneur in people, and the demand is always increasing, meaning you can expect to see more and more vegan businesses popping up around the town, in addition to more options at other cafes and restaurants too. Plus, what a great thing it is for our town and its tourism industry, encouraging more people from far and wide to visit historic Colchester; due to the fantastic cruelty-free offering we have available. So if you haven’t already been to check out one of these local businesses, come on down to vegan town! Colchester’s 3rd Vegan Fair takes place at The Waiting Room (11am-Late) this Saturday 20th August. There is no entry fee, and everyone, vegan or not, is encouraged to come along to support our local vegan businesses. To keep up to date with the latest in vegan news and vegan finds, like our Facebook page here or follow us on Twitter here. 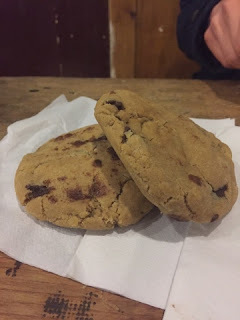 For those of you who are yet to venture to 'The Waiting Room', the location of the 2015 Colchester Vegan Fair and previously 'Vegan Pot Luck' meetings; the former bus station café is a strange and interesting hidden gem of a venue. 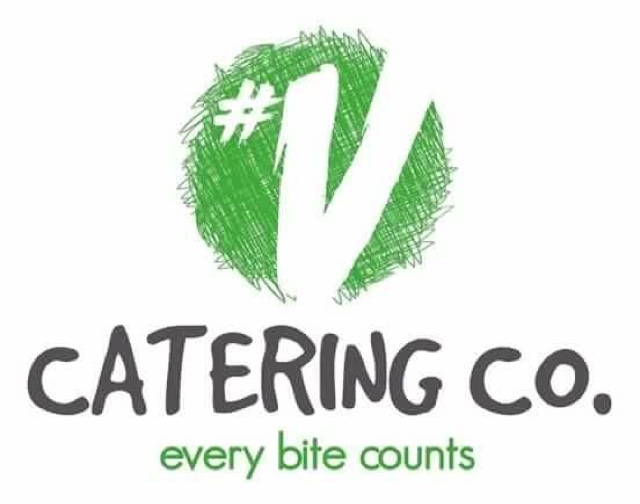 It has also become home to '#V Catering Co.', once a month, for their 'street food' events, with this month seeing the return of their popular noodle night. 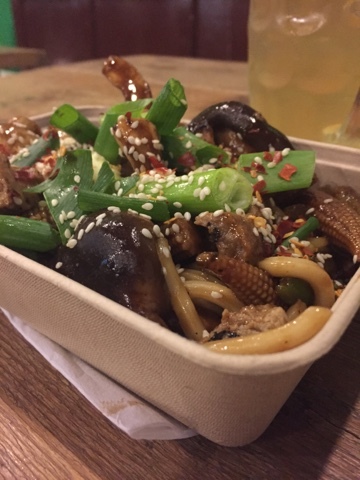 Delicious Udon noodles surrounded by crunchy veg, juicy mushrooms, optional seitan and covered in a flavoursome hoisin and miso sauce. Alongside the main meal, there were pots of #V's homemade 'coconut bacon' available to buy, in addition to three sweet dishes. Of course it only felt right that I should try all three sweet offerings. First up, the gooey chocolate flapjack with whipped vanilla and coconut cream. Yes, that does taste as good as it sounds! This was so nice I actually had to go back and get a second portion, which I believe tells you all you need to know. It was great to see two other dessert options on the menu, both equally as yummy as the flapjack. A soft and tasty chocolate chip cookie, and well textured New York cheesecake. It's always great eating out and having a vegan dessert, but to have choice between different options was even better. The desserts had my omni friend exclaiming that she couldn't believe the food had any of the traditional ingredients missing- and she couldn't tell a difference from their non-vegan equivalents- praise indeed! I was also pleased to find that the sometimes slightly overbearing music of previous street food events had been held back until later into the evening, being replaced by some more appropriate background music which allowed for easier conversation. So be sure to free up the third Friday of every month, and don't come expecting a restaurant-style atmosphere, this is very much a fun pop-up, canteen-type set up, which I feel only adds to its charm. If you're anything like me, you will leave full up, satisfied and looking forward to the next street food event to come along! PLEASE NOTE: SINCE PUBLISHING THIS POST DECOUVERTE HAS TAKEN ALL DAIRY FROM THEIR MENU, AND BECOME COLCHESTER'S 3RD VEGAN CAFE! As Colchester continues on its path towards vegan dominance, cruelty free consumers will be pleased to hear of Colchester's brand new vegetarian café. 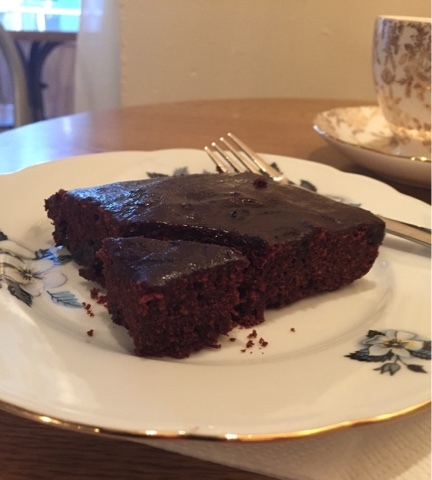 Following in the footsteps of Colchester's two fully vegan establishments, comes 'Découverte', which opened on Boxing Day 2015 and consists of a small vintage shop alongside an organic, vegetarian café. Much of the food they serve is vegan, and is clearly labelled with the 'V' symbol. Due to the cold weather outside, I decided that I needed warming up with a cup of tea served in a beautifully delicate teacup, accompanied with oat milk. 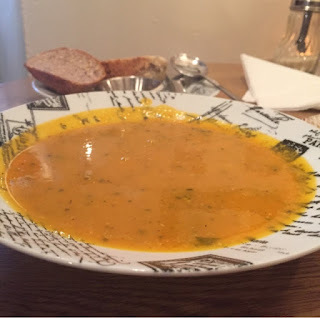 Whilst continuing along the 'warming' theme, I opted for the homemade 'lentil and squash' soup of the day, served with seeded bread. Coming in at £3.50, this seemed good value for such a tasty, hearty meal. The freshly heated soup was thick, flavoursome and incredibly filling. The gluten-free vegan chocolate cake which followed, allowed for a sweet treat to finish. Whilst eating my food I was able to enjoy the beautiful beams and busy walls filled with different vintage items. The café feels small (with 5 tables squeezed into the space) but this is what gives it its character and charm. The owners clearly knew what direction they wanted to go in, and have done that well. Having spoken to the staff it is clear that they are passionate about the food they make and serve. The café was relatively quiet whilst I was in there, which allowed the owner to talk about the two years of hard work it's taken to get the business up and running, and I was pleased to see that they seem to have established the ways in which they differ from 'The Den at Twenty Three' and 'The Nourish Co.'(Colchester's other vegan cafés) in the hope that they will also thrive. I wish them every success, look forward to paying many more visits to the café, and hope that at some point they will be able to drop the dairy and non-vegan options from the menu in the future. If you pay a visit to 'Découverte' then let us know your thoughts! It's only been 7 months since Colchester got its first fully fledged vegan cafe in the form of 'The Den at Twenty Three', and now the ever-growing vegan community of North Essex is to be treated to a brand new eatery! 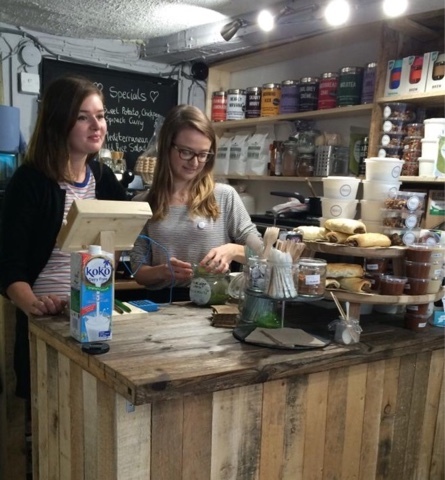 The Nourish Co. is marketing itself as an 'Eco-Takeaway'. Think raw cakes, tasty whole food lunches, and lots of healthy snacks; all served with a smile. We popped by on their opening day and tried their freshly baked Mushroom and Lentil Sausage Roll with a Raw Chocolate Brownie afterwards, both of which were very tasty. The shop itself, though small, has been used to its full potential, with a breakfast bar overlooking the street and small table area for anybody who wants to sit in. Not necessarily a place you'd meet a friend for lunch due to the limited space, but perfect for those short lunch breaks or when passing through town and in need of a bite to eat. How great it is to have even more choice in the town, and this can only be a good thing for making veganism more accessible. We're excited to watch the company grow and continue to spread their message of 'kind and conscious eating', and can't wait to try lots more of their wholesome, yummy food! Be sure to drop in next time you need a quick snack on the go. Get listed on Vegan Colchester! Vegans Can Eat More Than You Think!